Who are Candidate for Dental Implants? 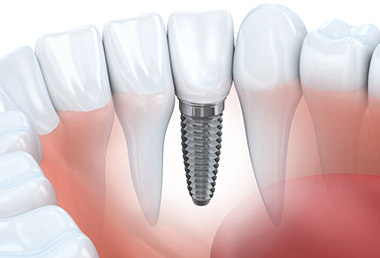 A dental implant is a titanium post that is inserted into your jaw to act as a replacement root for a missing tooth. An implant can support a dental crown, a dental bridge or a denture. 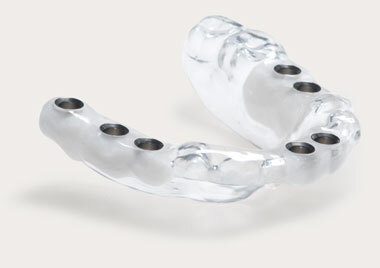 Implant-supported replacement teeth look, feel and function very much like real teeth. Implants are the strongest, longest-lasting and most lifelike form of tooth replacement in dentistry today. Dental Implants are the strongest, longest-lasting and most lifelike form of tooth replacement in dentistry today. 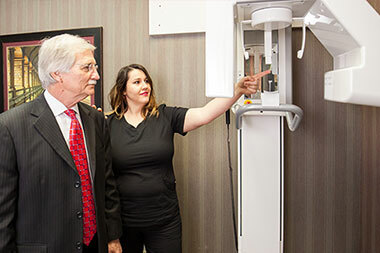 As prosthodontists, Dr. Rodriguez and Dr. Langley are highly-trained specialists in planning the treatment of every aspect of your smile restoration using dental implants. They guide the entire procedure from beginning to end, ensuring you will receive optimal treatment. 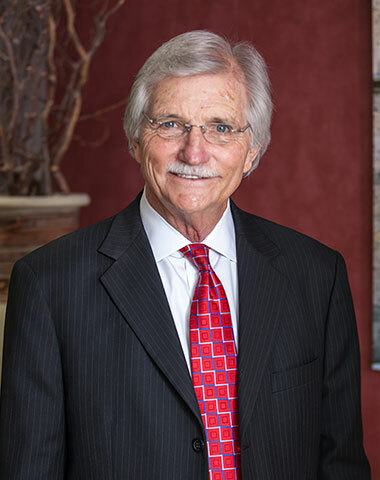 Your dental implant surgeon will be an experienced and proven local periodontist or oral surgeon who works in tight coordination with our doctors during your treatment. These specialists also share our doctors’ philosophy of providing personal, comfortable care and being in good communication with you about your treatment. Meet with our doctors and find out if you are a candidate for dental implants. In the past, patients with medical problems such as diabetes, patients who were heavy smokers and patients who had heavy bone loss in their jaw were not eligible to receive implants. However, advances in implant placement technology and modern bone grafting techniques now make it possible for most patients to receive implants safely. 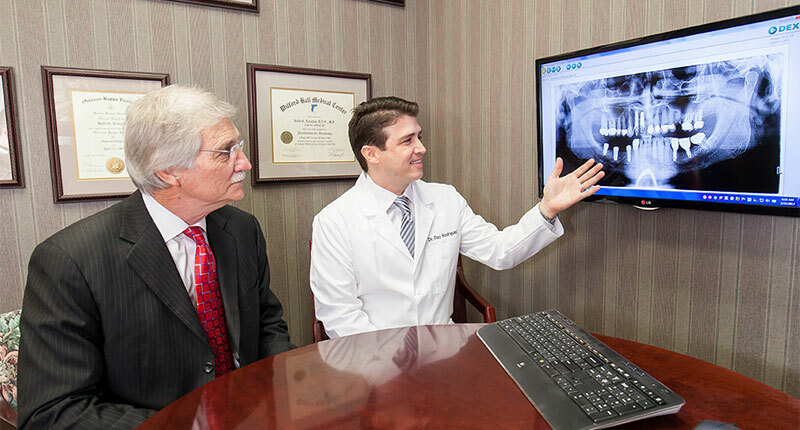 Our doctors are specialists at planning the treatment for implant cases. There are no age restrictions for receiving dental implants. The only exception is young persons whose jaws have not fully developed. Our doctors can tell you if you are eligible for dental implants, after a comprehensive examination. 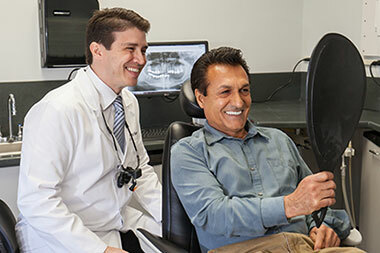 Dr. Rodriguez and Dr. Langley guide every element of the procedure, from diagnostics and planning to the placement of your permanent new teeth. They work in close coordination with your surgeon, who places the implants. They work in partnership with our in-house ceramist to create the high-quality replacement teeth your implants will support. We use state-of-the-art digital scanners to get an accurate image of your teeth and jaw. We start with a comprehensive exam with digital X-rays and any needed digital photos. You will also receive a dental 3D CT scan of your lower face and jaw area, if needed. The scanned images provide crisp 3D 360-degree views of your teeth, bone levels in your jaw and surrounding anatomy. 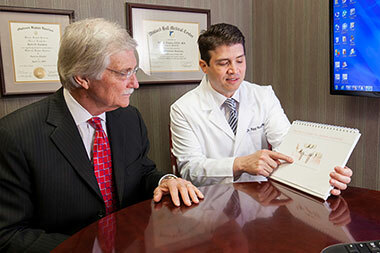 Our doctors and your surgeon use these images for precise treatment planning. Dr. Rodriguez and Dr. Langley meticulously plan your treatment so that your implants are placed stably and in the optimum position to support the replacement teeth that will be mounted on them. Using the 3D images in our special planning software, our doctor maps out the precise position and angle of your dental implants, in partnership with the periodontist or oral surgeon who will place them. Your surgeon will also plan out any needed bone grafting to ensure proper support for the implant. A surgical guide can be used to assist in accurate, efficient and minimally invasive implant placement. When needed, your surgeon will manufacture a surgical guide to assist in accurate, efficient and minimally invasive implant placement. A surgical guide is a template that fits over your dental arch and marks exactly where and at what angle your implants are to be placed. If the bone where the implant is to be placed is inadequate to ensure stability, your surgeon will place bone graft material at that site to regenerate the needed bone. Our surgeons use the latest bone regeneration materials and techniques to make your bone grafting minimally invasive and efficient. For eligible candidates who need all of their teeth replaced, our doctors can provide implant-supported, fixed-in new teeth in a procedure called All-on-4 New Teeth in One Day. For most patients, this procedure requires no bone grafting. If you need a full arch of your teeth replaced, you can find out if you are a candidate for All-on-4 in a comprehensive evaluation. When performing an extraction, your surgeon gently removes the tooth using a method that will preserve the maximum amount of surrounding gum and bone. This method minimizes swelling, speeds healing and often reduces the amount of bone grafting needed. The doctors can place functional and aesthetic replacement teeth the same day as your surgery. If the newly placed implant has adequate bone support and stability, our doctors place a functional and aesthetic temporary restoration (crown, bridge or denture) that preserves your smile and ability to chew while the implant heals. If the implant is not stable enough to support the pressures of chewing, you will receive an aesthetic and lifelike cosmetic restoration that puts no pressure on your implant but preserves the look of your smile. Your final restorations are placed once your implants have fully healed. Our doctors give your comfort top priority during treatment. Your doctors explain what will happen and answer all your questions so that you can feel at ease. Our injections are administered so that they cause little to no sensation. The doctors minimally invasive procedures lessen discomfort and speed healing time. For your added comfort in the dental chair, we provide blankets and pillows. For extra help with anxiety, or for long procedures, Dr. Rodriguez and Dr. Langley provide nitrous oxide or oral conscious sedation. Your surgeon can also provide IV sedation, if needed. We design and fabricate your new teeth in our state-of-the-art, in-house dental lab. 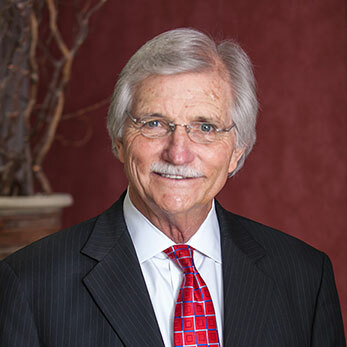 Dr. Rodriguez and Dr. Langley are specialists in the aesthetic restoration of teeth and the creation of replacement teeth. 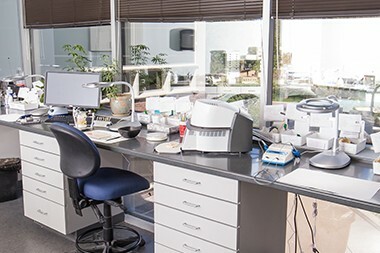 They design and fabricate your new teeth using our state-of-the-art computerized design and milling system, which is part of our in-house dental lab. Our lab ceramist works in partnership with our doctors to produce your restorations so that they are durable, aesthetic, natural-looking and align optimally in your bite, once placed. Your doctor will place your final restorations and will make any adjustments needed so you are completely happy with their fit and appearance. Dental implants have numerous benefits and advantages that make them the optimum form of tooth replacement for anyone who can receive them. First, implants act like real tooth roots and allow your replacement teeth to have strong chewing power; close to the same chewing power as natural teeth. Traditional dentures provide only minimal chewing power. Implant-supported individual teeth and dental bridges also keep the adjacent teeth stable in their positions, preventing them from drifting and causing problems with your bite alignment or ability to chew. Additionally, chewing with implant-supported teeth (including implant-supported dentures) creates the pressure on your jawbone needed to preserve its volume and density. Chewing with traditional dentures does nothing to stop bone loss in your jaw and, in fact, accelerates it. Dental implants are the longest-lasting form of tooth replacement. Crowns and bridges can often last for a couple of decades; however, dental implants, if properly cared for, can last a lifetime. “Dr. Rodriguez is very friendly and open, and doesn’t try to overdo what you need. He explains all the scenarios and gives you financially practical options. “The staff are the same. 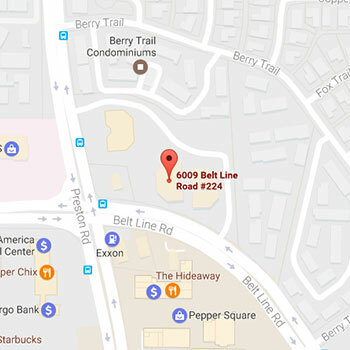 They are very friendly and open, very helpful and very accommodating. They go out of their way to work with me.